Of all the forms of divination fortune dice happens to be one of the most popular. It is practiced and has been used as a method of foretelling for a long time. Over time however some changes have been brought in the analysis and interpretation of its readings. Foretelling with the help of fortune dices helps in answering certain questions related to the current situations and conditions. If anyone is expecting something because of his or her deeds in the past then questions related to that could be answered by a fortune dice reading. This is very helpful for the people because it gives them a chance to get to know about some of the opportunities that may be coming in the future and then the person could do his or her best in order to grasp that opportunity. 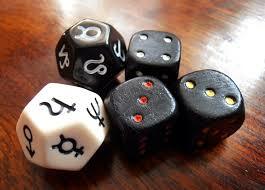 There are many experts who specialize in the system of divination through fortune dice. However these experts are pretty difficult to approach and are very expensive. In addition to this there is no guarantee of their reading that if it’s accurate and precise or not and this is dangerous because a wrong reading might lead to some serious and detrimental consequences. In order to avoid this entire hassle one could use the tool presented over here. This dice of fortune calculator is free to use and its readings are easy to read. Not only could this calculator be used from the comfort of the home but the accuracy of their readings could also be guaranteed and the opinion of past users could be seen from the reviews. The oldest dice is about 5000 years old and is from the place where currently Iran exists. The dices of present times have six sides. The term Die, which happens to be the singular term for dice, is seldom used. There is a slight difference in the kinds of dice used in Asia compared to the ones used in the west. In the Asian dice, the one spot and the four spot are more often than not colored. The spots in western dice are spread out and are not centered contrary to the Asian Dice. To use this tool all one needs to do is enter the full name and click on the button with Roll the Dice of Fortune written on it. After this, in the next page that comes up user is asked to click the button with “Cast dice three times” written on it. Once this is done a detailed report comes up containing the three numbers that come up during the three casts. The interpretation of this number is also given. The user is again asked to click on the button with “Cast the dice two times” written on it. Then again a report comes up containing three numbers and their interpretations. Once again the user has to click on the button with “Cast the dice third time written on it” and the dice is cast for the third time. Again a report comes up containing the numbers and their interpretations and suggestions. Even though the method of foretelling through cast dice is pretty old its users and believers have only increased because of its established accuracy in future prediction. Previous How Do I Summon A Dragon Familiar?